Everythingneon neon signs have a warm mesmerizing glow, and are powered by industrial strength transformers, which operate silently and more efficiently than incandescent bulbs. Everythingneon Junior Neon Signs feature multi-colored, hand blown neon tubing. The glass tubes are backed by a beautiful full-color image, and the entire sign is supported by a black finished metal grid. The sign can be hung against a wall or window; they can even sit on a shelf. All you do is hang it up and plug it in - no assembly or special wiring required. 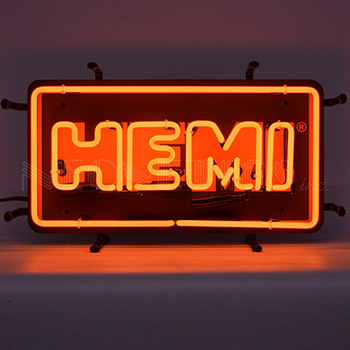 The Hemi Junior Neon Sign by Everythingneon has a full color background with bright orange neon lights, and measures 17 inches wide by 10 inches tall. For indoor use only. Give your home, garage, basement or business the fabulous glow of real neon by Everythingneon! For indoor use only. Hemi Junior Neon SignI purchased two neon signs from Everything Neon in 2008. The customer service was exceptional. These signs truly are the focal point of my decor. They compliment my modern retro style home and add to the ambiance. I get many compliments about how the signs add to the glamour and fun of my loft.